ALavandhAr enjoys emperumAn‘s form and his qualities which are the abode of such relishable aspects that bring pleasure to pirAtti. achinthya – Here, avAngmanasa gOcharathva (inconceivable nature – i.e., beyond speech and mind) of the qualities of his divine forms are explained. dhivya – Being spiritual/divine as said in mahAbhAratham SAnthi parvam 206.60 “na bhUtha sangha samsthAnO dhEhO’sya paramAthmana:” (The divine body of paramAthmA is not made of the five elements (earth, water, fire, air and ether)). adhbhutha – Whatever aspect that is perceived, being amazing. 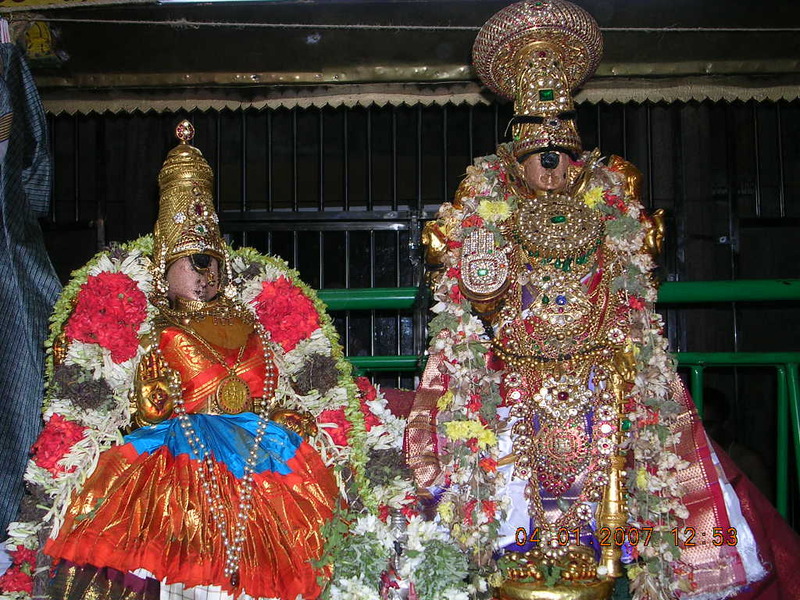 Being as said in periya thirumozhi 2.8.7 “muzhusi vaNdAdiya thaNduzhAyin moym malarkkaNNi” (wearing garland made of cool thiruththuzhAy leaves which were dripping with honey from the bees …). nithya – his eternal nature is explained. yauvana svabhAva – Being as said in rig vEdham ashtakam 2.8.25 “yuvA’kumAra:” (having youth and a little bit of childish physical features – i.e., leaving child stage and entering in to youth stage). Having natural youth as said in SrI rAmAyaNam AraNya kANdam 19.14 “tharuNau rUpasampannau …” (SUrpaNakhA says – [SrI rAma and lakshmaNa] are youthful; are fully beautiful; …). lAvaNya maya – Having wholesome beauty. amrutha udhadhim – Due to relishable aspects in all manners, he is said as an inconceivable ocean as said in SrI rAmAyaNam yudhdha kANdam 19.31 “apramEyO mahOdhadhi:” (vibhIshaNa says – SrI rAma, who is the king, is qualified to surrender unto the ocean; was this immeasurable vast ocean not dug by sagara?). Sriya: Sriyam – As said in periya thirumozhi 7.7.1 “thiruvukkum thiruvAgiya selvan” (emperumAn who is the thiru (wealth) of thiru (mahAlakshmi)), one who gives auspiciousness to pirAtti herself. bhaktha janaika jIvitham – As said in thiruvAimozhi 6.7.1 “ellAm kaNNan” (krishNa is everything), for his devotees, he is the one who sustains them etc. Also explained as, emperumAn who has his devotees as those who sustain him. mahAbhAratham udhyOga parvam 74.27 “mama prANA hi pANdavA:” (pANdavas are my life). samartham – you who is enjoyed by nithyasUris (eternally free souls in paramapadham (spiritual realm)) who are fully knowledgeable, is capable of letting the nithyasamsAris (eternally bound souls in samsAram (material realm)) enjoy you progressively as said in thiruvAimozhi 4.5.5 “ARRa nalla vagai kAttum ammAnai” (the benefactor who shows the path to enjoy him slowly and steadily). Apath sakham – You who have the nature of helping when some one calls out desperately as said in thiruvAimozhi 8.5.2 “kANavArAy enRu enRu kaNNum vAyum thuvarndhu” (when my eyes and mouth became dry, while calling out repeatedly to see you). arthi kalpakam – emperumAn who magnanimously presents himself as said in thiruvAimozhi 2.7.11 “ennai Akkik koNdu enakkE thannaith thandha kaRpagam” (created me, acknowledge me and gave himself to me like a kalpaka tree). This entry was posted in Other, sthOthra rathnam on February 4, 2017 by Sarathy Thothathri.